This article was circulating yesterday, but I didn't have the opportunity to share it. Here it is, in case you missed it. Rats have been repeatedly exonerated as the cause of Bubonic Plague - first we learned it was the fleas and not the rats themselves that spread the deadly disease. Then we learned that many cases of bubonic plague were actually pneumonic plague and spread from person to person. Now, we learn that the timing of the outbreaks did not coincide with weather conditions that would have led to increased population of rats. 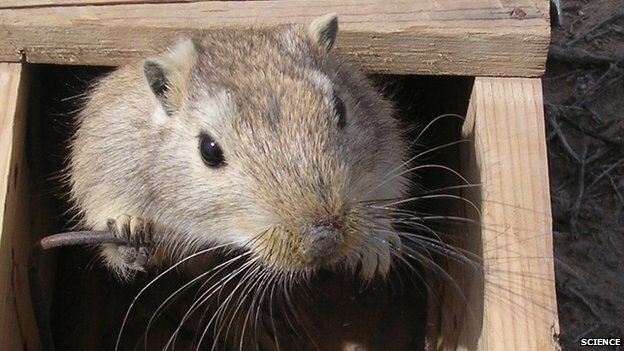 Instead, the outbreaks occurred a few years after wet springs and warm summers in Asia, which would have been optimal conditions for gerbils in those regions. After such conducive conditions for gerbils and fleas occurred in Asia, there would be outbreaks in harbor towns in Europe as the gerbils/fleas traveled along with the silk trade. Those outbreaks then spread throughout the rest of the continent. And yet, after all this evidence, people will continue to blame the poor maligned rat for this curse upon humanity. But the gerbil, mark my words, will get off scot free. Well played, gerbils. Well played. 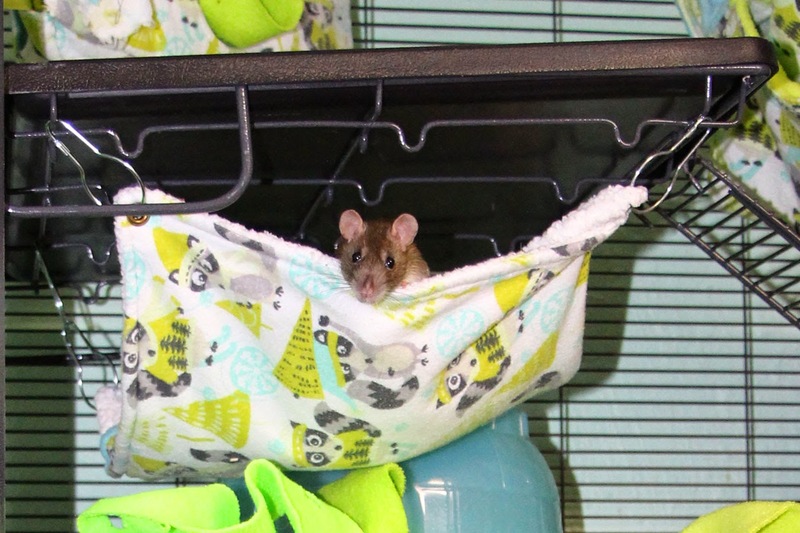 Lilly discovers the joy of the hammock in her new top half of a DCN. Lilly is officially and definitively Not Pregnant! It has been 23 days since I took her in. Given the normal gestational period is 21 - 23 days, we should be in the clear. Thus, I have scheduled her for a pre-spay appointment on Thursday, and hopefully a spay the following week if she checks out okay and there are any openings on the vet's surgical calendar. Gandolf had what I thought was an abscess on his side/thigh area. When I got him to the vet, the lump had become less prominent, being only visible when he stretched. Turned out, the lump was a hernia and not an abscess at all. The good news is that the vet said that it is correcting itself, and that seems to be the case. I can no longer see the lump at all. But introductions between the new rats and the existing rats won't be taking place until I am sure he is completely healed, as I do not wish for him to reinjure himself during a scuffle. Should the lump get worse, he may have needed surgical intervention, but it looks like that is not going to be necessary. The old cage on the right, with Burt, Ruby, Hammie, and Jeremy. A couple of weeks ago, I decided that I wanted a second DCN for Lilly and her boys. Unfortunately, I missed out on the good deal currently at Petsmart, but hopefully others were able to take advantage of it. I really prefer this cage to any other and I am happy to have all the rats in DCNs in the rat room. Lilly is on the top half, with the ramp zip-tied in the up position and the full tray moved from the lower level to the upper level so there is no window/access to the cage below with the boys. The existing rats aren't too pleased about their new neighbors. All four have been known to pace the adjacent wall all puffed up and indignant looking. They are not quite ready for introductions yet, but that is okay, as Gandolf needs to heal completely and I want to have Lilly spayed and moved back in with her boys before getting to that. In the mean time, they can adjust to being neighbors and watching the new rats play in the rat room during their turn at out time. If/when the two groups are introduced, I would like to convert the two DCNs to a quad. It might be a little more complicated because the latest DCN design has added a bolt to the side leg of the stand and that bolt may prevent the two cages from standing completely flush against each other. However, any gap should not be large enough for rats to escape through. So I believe it will still be possible. Not looking forward to taking the cages apart and putting them back together, though! That is always an ordeal. Petsmart sells the Midwest Dual Critter Nation rebranded as the All Living Things Multi-Level Small Animal Cage. They sell this cage in their stores. It is currently sale priced at $199.99, with 15% off if you buy online and choose "Pick Up In Stores," making it $169.99 plus tax. Strychnynegirl on the Goosemoose forums called Midwest about this cage and they confirmed that it is manufactured by Midwest for Petsmart and is identical to the DCN and fully compatible with add-ons and such. 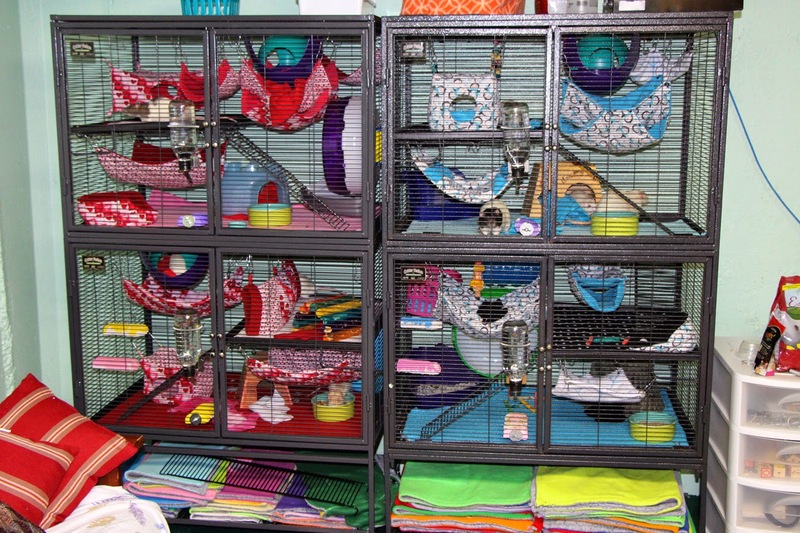 This is an incredible price for one of the best cages that you can buy for rats. It is possible that this is a President's Day Sale, in which case, the sale price may not last past tomorrow (Monday), so if you are in the market for a DCN and want to save some money, you may want to snap up this deal over the weekend. 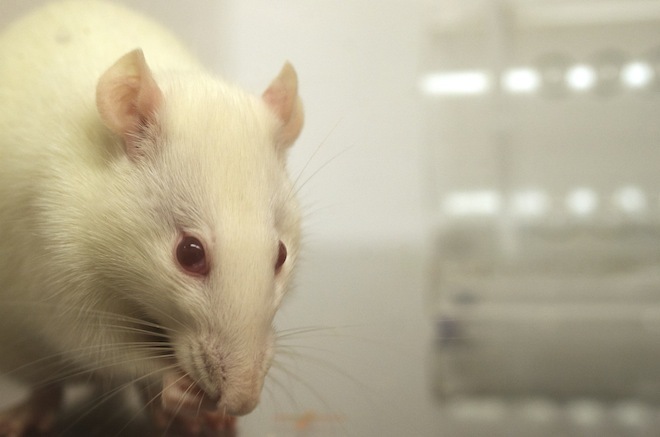 The Intriguing New Science that Could Change Your Mind about Rats, published by Wired in January, takes an in depth look at rats and empathy. It talks a lot about the study blogged about previously (More on Rats and Empathetic Behavior) but goes well beyond that study alone to take a close look at rats and how they behave toward each other and whether or not they may have more complex emotional motivations than many give them credit for. 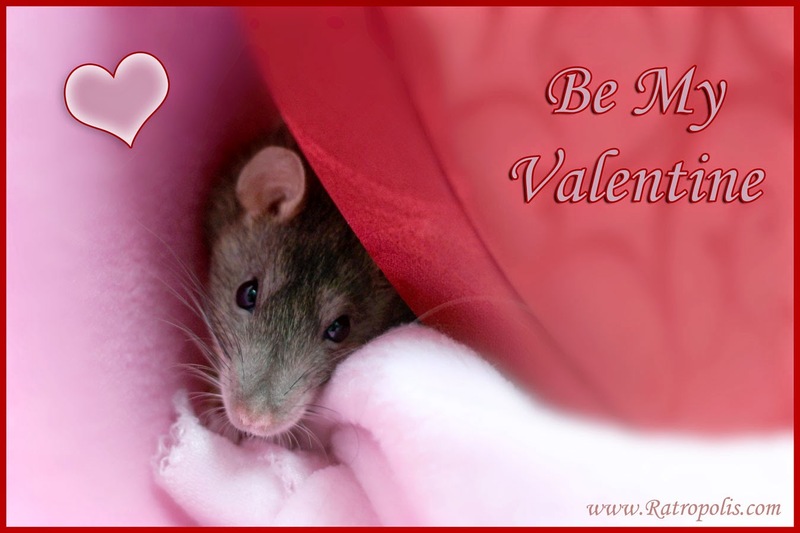 It treats rats, even wild rats, with respect and sympathy. It is a good read: educational, professional, and positive. Be sure to check it out.